Over one year ago, Yatzer covered the whimsical design of the chic Café Germain, a restaurant designed by India Mahdavi, on the Rue de Buci in Paris. 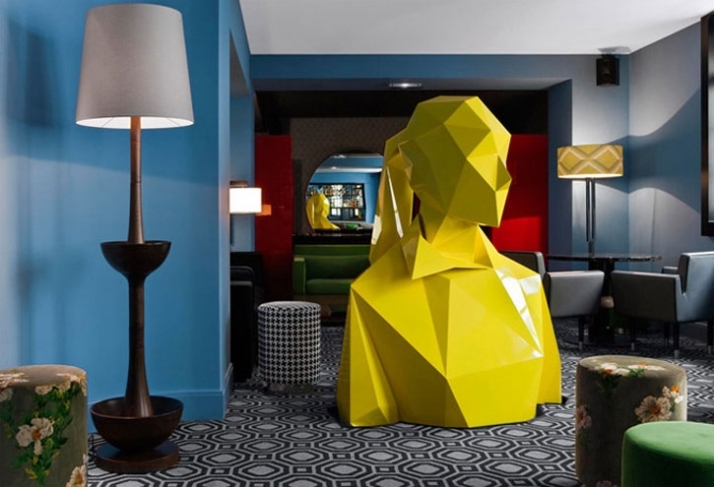 The Iranian born and Paris-based architect Mahdavi provided a wonderland of sorts, with oversized furniture, checkerboard floors, and larger than life chess-pieces for bar stools. It was not only the bold colors and courageous use of lines and angles that we fell in love with, but it was the stunning “Sophie” that we couldn’t stop thinking about. A sculpture created by artist Xavier Velhain, the yellow statue was molded after his friend Sophie, so large that it towers above the restaurant and through both levels of dining rooms. 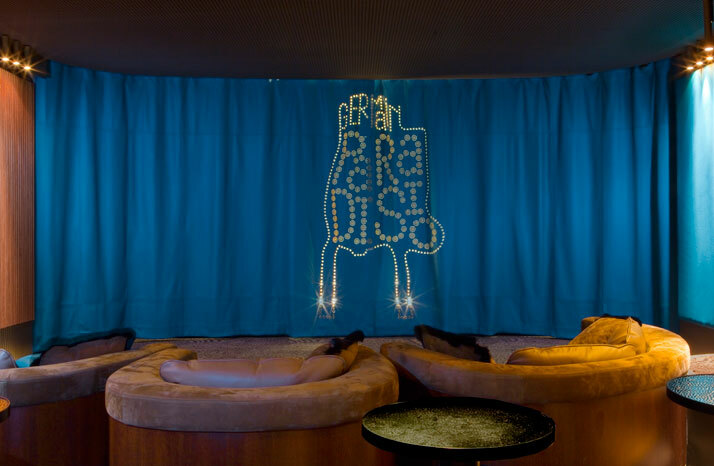 Part of the Costes family restaurant group, the Café Germain has expanded below and Mahdavi is at it once again, this time with a toned down, more mysterious and sensual design for the private cinema that has opened in the basement of Café Germain. 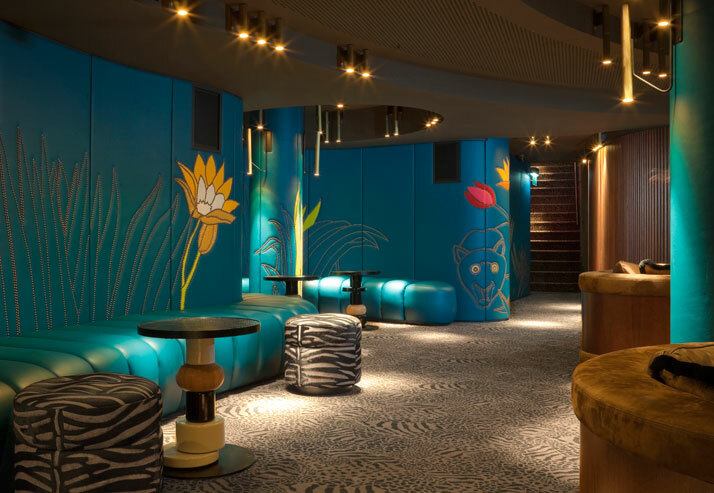 Where the top two floors of the café are sharp, vibrant, and staccato, the subterranean lounge is smooth, earthy, legato. One “giant curve.” The juxtaposition from the upstairs café to the downstairs hideaway is brilliant, the cinema-lounge a perfect yin to the café’s yang. 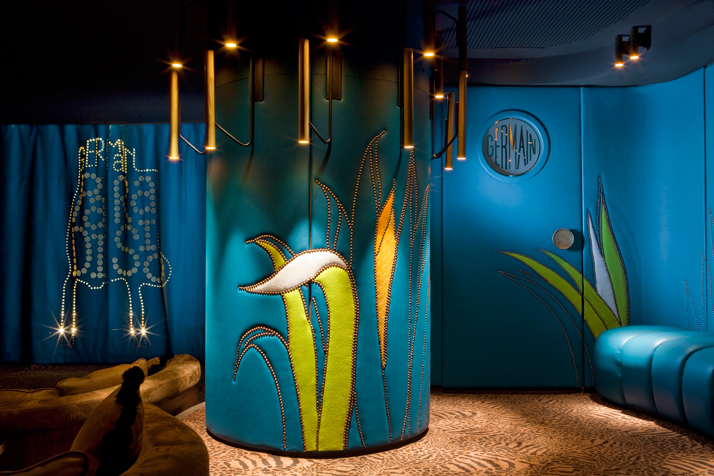 Paradisio looks to the jungle for its palette. 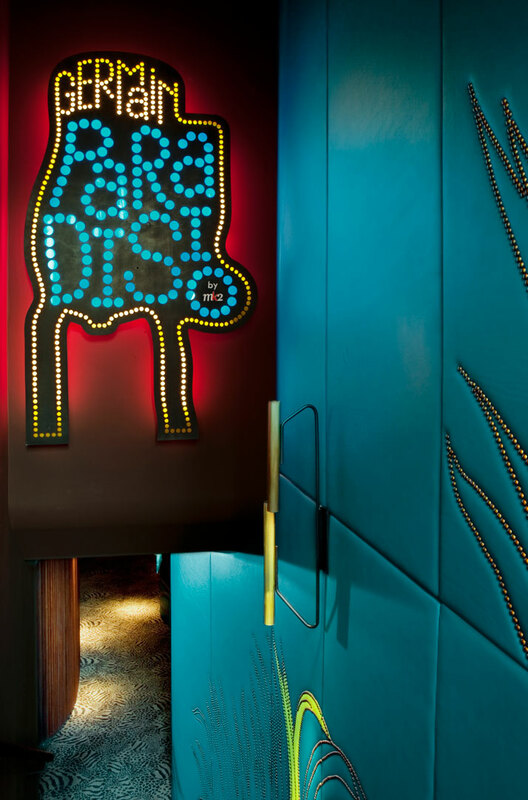 Browns, blues, and bronze make way for the wild abstract animal carpet and somehow it all works together seamlessly. 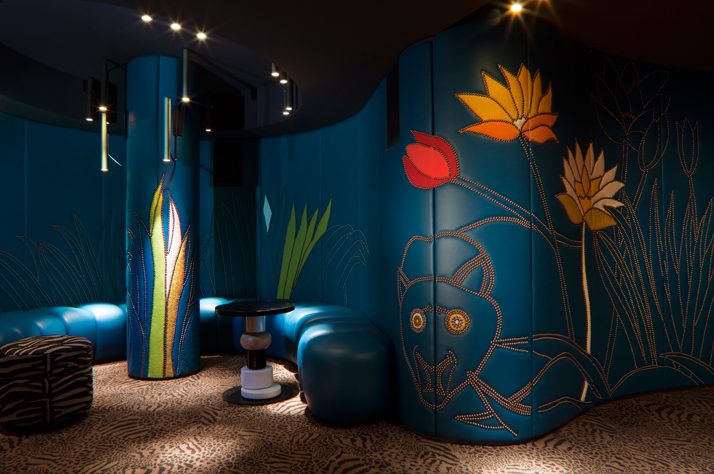 Attempting to create a “stylized jungle setting and ultramodern paradise”, the use of curves envelops the seating areas inherently offering privacy. The lush banquettes and circular lounge chairs are plush and luxurious. Everything about the world below is inviting, almost seductive. 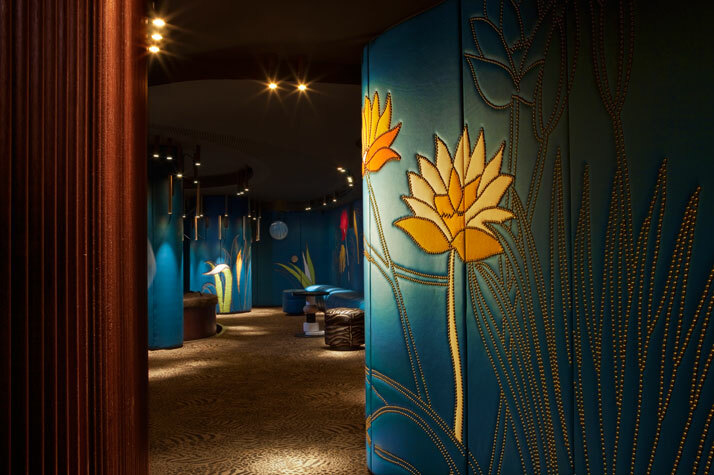 The walls and columns have been enveloped in a “Peacock Blue” leather with studded frescoes embossed into them depicting a lion, a bird on a branch, a flower, and jungle plants throughout the room. 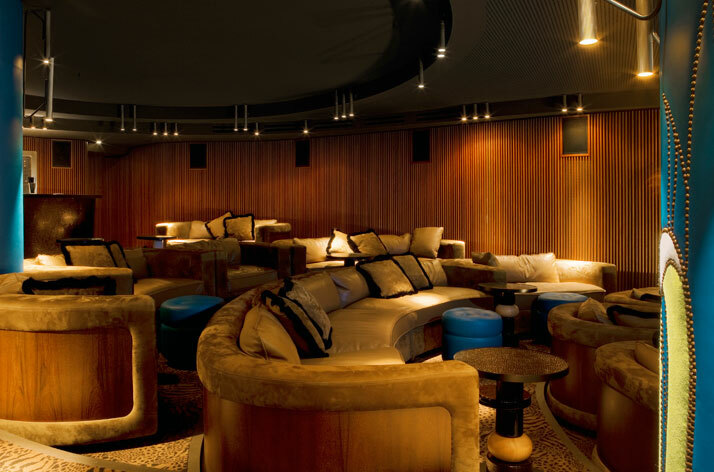 Who wouldn’t want to curl up with a class of champagne and enjoy a movie in one of the many nooks?